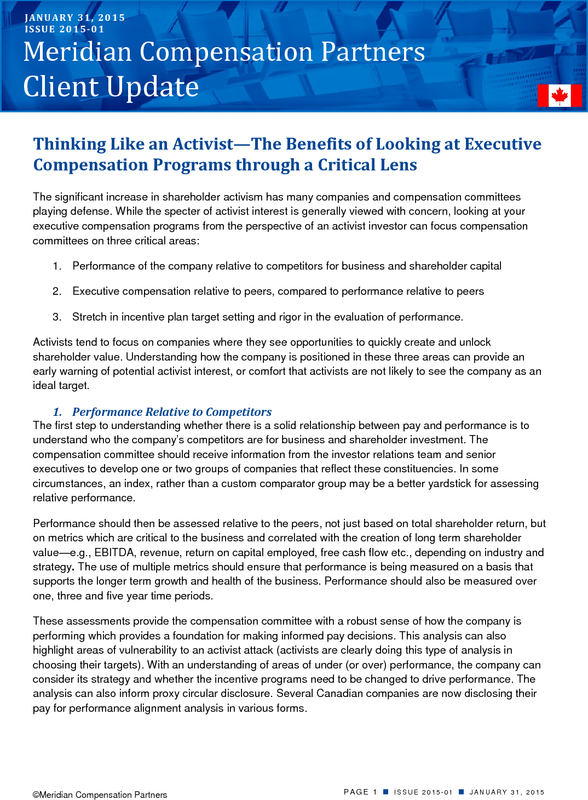 Looking at your executive compensation program from an activist perspective will help you assess how likely it is your company will have to deal with activist investors. Stretch in incentive plan target setting and rigor in the evaluation of performance. Activists tend to focus on companies where they see opportunities to quickly create and unlock shareholder value. Understanding how the company is positioned in these three areas can provide an early warning of potential activist interest, or comfort that activists are not likely to see the company as an ideal target. 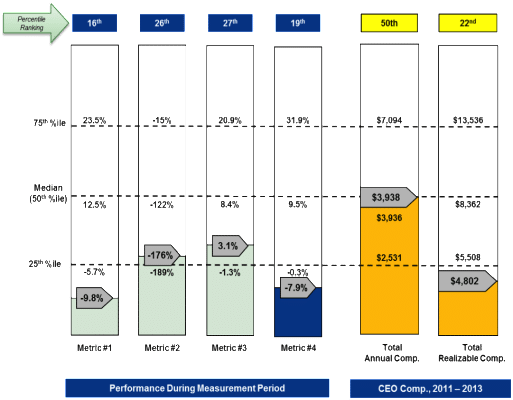 The first step to understanding whether there is a solid relationship between pay and performance is to understand who the company’s competitors are for business and shareholder investment. The compensation committee should receive information from the investor relations team and senior executives to develop one or two groups of companies that reflect these constituencies. 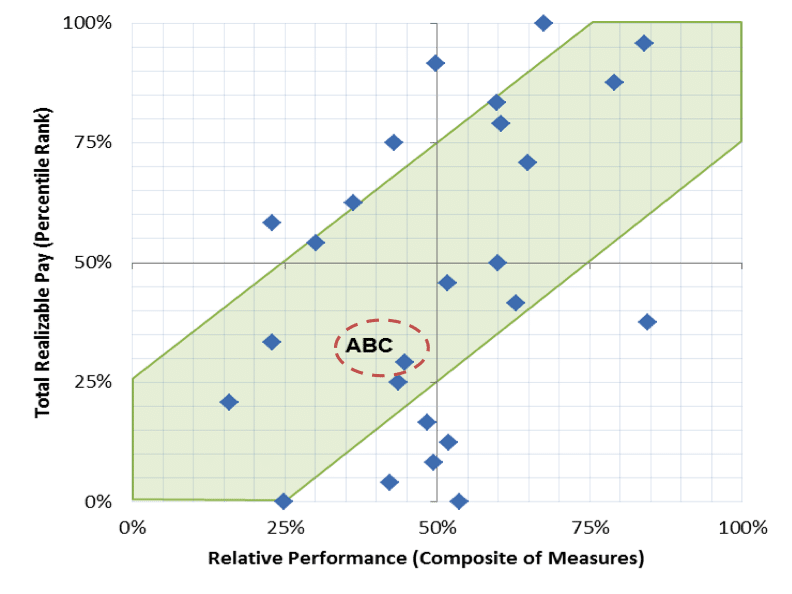 In some circumstances, an index, rather than a custom comparator group may be a better yardstick for assessing relative performance. Performance should then be assessed relative to the peers, not just based on total shareholder return, but on metrics which are critical to the business and correlated with the creation of long term shareholder value—e.g., EBITDA, revenue, return on capital employed, free cash flow etc., depending on industry and strategy. The use of multiple metrics should ensure that performance is being measured on a basis that supports the longer term growth and health of the business. Performance should also be measured over one, three and five year time periods. These assessments provide the compensation committee with a robust sense of how the company is performing which provides a foundation for making informed pay decisions. This analysis can also highlight areas of vulnerability to an activist attack (activists are clearly doing this type of analysis in choosing their targets). 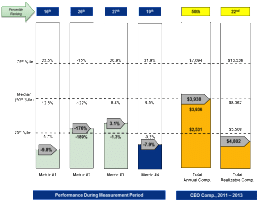 With an understanding of areas of under (or over) performance, the company can consider its strategy and whether the incentive programs need to be changed to drive performance. The analysis can also inform proxy circular disclosure. Several Canadian companies are now disclosing their pay for performance alignment analysis in various forms. 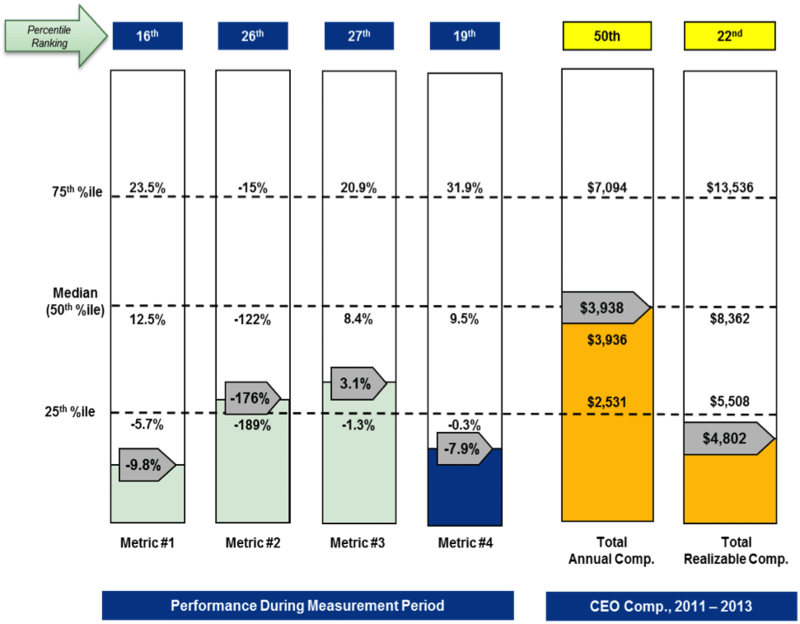 The charts below show the pay and performance at ABC Co relative to its peers. The first chart shows a breakdown of performance on a number of key metrics, the second chart shows the information aggregated to create a “zone of alignment”. Armed with this analysis, the compensation committee is in a position to identify and address pay for performance disconnects which draw negative attention from shareholders and may give an activist investor a foothold to bring a hostile proxy solicitation. The key to ensuring that pay is aligned with performance is for the compensation committee and management to ensure that incentive targets are set with sufficient stretch. 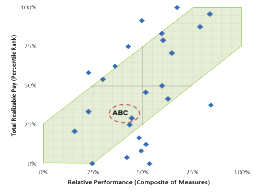 This is discussed in detail in the Meridian Update titled “Setting Annual Incentive Targets – Increasing Alignment with Performance”. The exercise by the compensation committee of discretion to adjust payouts that would otherwise be driven by the quantitative measures. Generally discretion should be exercised in circumstances where the compensation committee has a compelling rationale to disclose to shareholders. 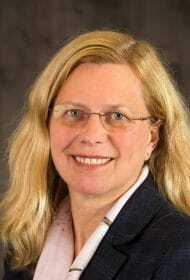 A basis for pro-active disclosure to shareholders.